How can I print the page I want in my 3D page flipping books when I finish converting? Q:How can I print the page I want in my 3D page flipping books when I finish converting? You must be interested in whether the flipping book can be printed or not after conversion. The answer is certainly Yes because you can use the function of print in the 3D page flip book software. No matter you made a digital product brochure, a picture album online or a wonderful magazine with page turning effect, you can print the pages you want whenever you like. Now you can follow the steps here and print targeted page by yourself. Step1: Start up the 3D PageFlip Standard, turn to the tool bar on the right corner of the interface. Find out the print button and click. Step2: You can tick "Print all page" if you want to print all pages of the 3D flipping book. 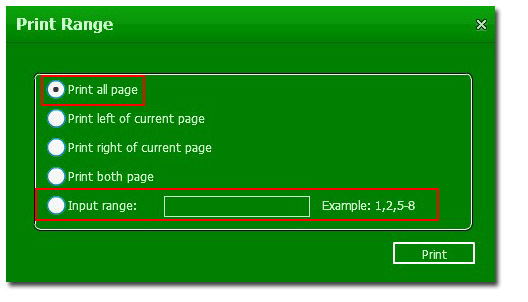 Or you can define specific page to print in the "input range". Click Print after setting.